I can only comment as an adult, but one who has enjoyed many animated children's films. This one, however, left me cold - or almost, because I will say that I loved the atmospheric use of colour and the beautiful tableaux. But there was little character development, the humour was very one-dimensional and the action sequences seemed mechanical and meaningless - the kung-fu moves were fast and furious but not particularly creative. So, this may be great for kids, but this grumpy old grown-up doesn't think it works on an adult level as well. 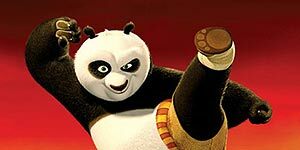 great kids film, bright and colourful animation and an entertaining story... my kids loved it and are now out to buy every piece of kung fu panda merchandise they can find! !